Classter provides teachers the opportunity for quiz management either online or offline. Create a quiz according to your needs, while the system allows the creation of a collection of questions per course or academic sector. Create your quizzes as an examination strategy or distribute them using assignments and daily homework. Classter offers schools, teachers or academic advisors the possibility to conduct online surveys. Hence, you do not need an expert to create, manage and distribute a questionnaire-based survey, as with Classter you can easily build and distribute your questionnaire to your students, parents or teachers. Use Classter Quiz Builder to design your questionnaire and distribute it automatically per course, class, curriculum, mentor or teacher. Additionally, it is possible to monitor in real-time the respondents that answer your surveys, create and distribute different questionnaires per course of teacher and provide productive feedback to mentors based on the survey’s results. Moreover, it is also possible to launch an anonymous survey using tables in the classroom and without logging in, your students can evaluate for instance a lesson or a teacher. Classter provides an advanced Quiz creation tool that allows users to easily built a quiz or questionnaire. Create question banks per subject or course and then use them to build your quiz or questionnaire in seconds. 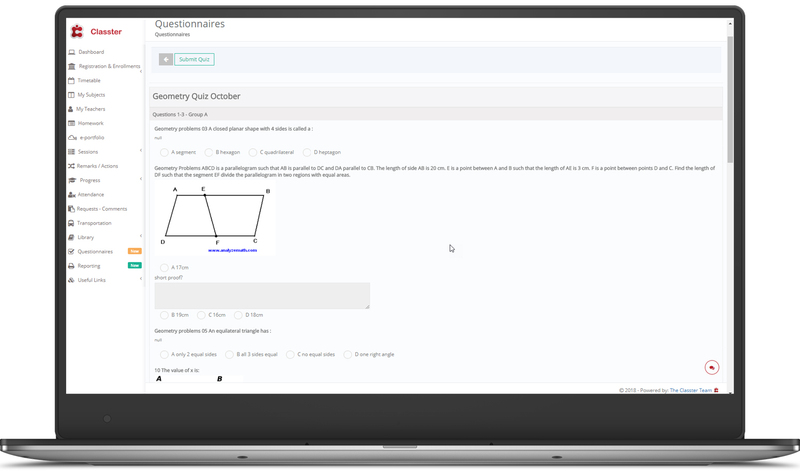 Quiz builder, with its user-friendly interface, will allow you to create unique and dynamic quizzes, while you will be in control of the structural design. Classter offers the opportunity to calculate student’s scores. In case the quiz has open-ended questions, the system allows the teachers to evaluate student’s answers online. 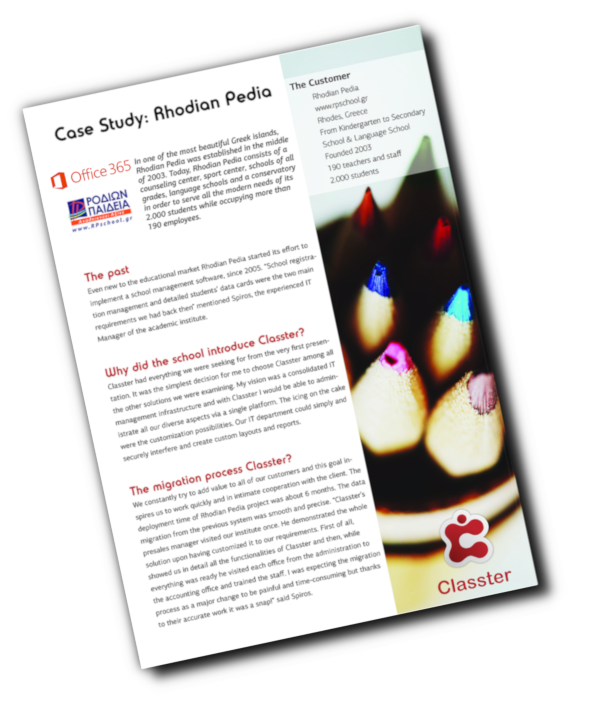 Additionally, Classter provides answer sheets, where the students can give their answers on the paper that can be scanned by the school and automatically be imported into the system to calculate the score.